Most commercially manufactured brands provide an extra 16 to 20 grams of protein per scoop and can be mixed into milk, juice, water, and foods like oatmeal and yogurt or used in baking. The downside to buying protein powder is that it can be expensive, and some brands may contain flavors or ingredients you might not like. Making your own protein powder at home is fairly easy. 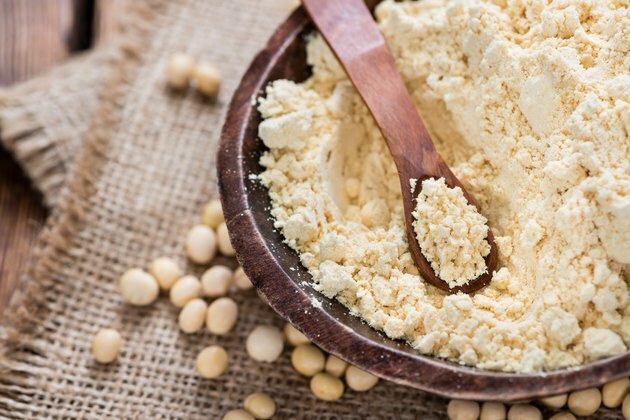 To make your own powder, start with a base of milk-based whey or casein, egg-based or plant-based soy, pea, rice or hemp. Good options include dried nonfat milk or dried egg powder, or for plant proteins, brown rice, quinoa, hemp seed, dried chickpeas or split peas. To make a powder out of these, use a blender or coffee grinder and grind them well. Don't use any other dried beans unless you cook them well first because they contain a natural toxin that can make you very sick. For flavoring agents, you can use powdered chocolate or vanilla, dried spices or edible fruit-flavored powdered extracts. You can also add a few drops of liquid flavoring extract like almond or peppermint to your protein drink. Another option is to leave your protein powder unflavored, so you can mix it with juice, bake with it or stir it into foods like soups, hummus or mashed potatoes. Enhance the nutrition of your powder by adding finely ground oats to give you some fiber. Nuts or wheat germ will give you a dose of healthy fat in each serving. Including dried nonfat milk powder will boost the protein even further and provide calcium, and adding powdered spirulina or matcha tea will provide additional nutrients and antioxidants to your protein powder mix. Since homemade protein powders won't contain preservatives or other ingredients to maintain freshness and extend shelf life, it may be necessary to make protein powder in smaller batches or take more care in how you store it. Ingredients like dried milk powder, nuts and wheat germ may spoil or degrade if left uncovered, especially in warm areas or if they're exposed to moisture or light. Like any homemade recipe, use it in a timely manner, and store tightly sealed in the refrigerator.